To try to kick-start the crafty drive, I’ve been dabbling in a few creative things like…. 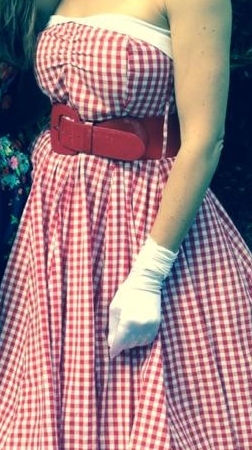 …adding a bias band to the bodice of a poor eBay buy to create a vintage style dress. “Gertie’s New Book for Better Sewing” was a great inspiration and help! 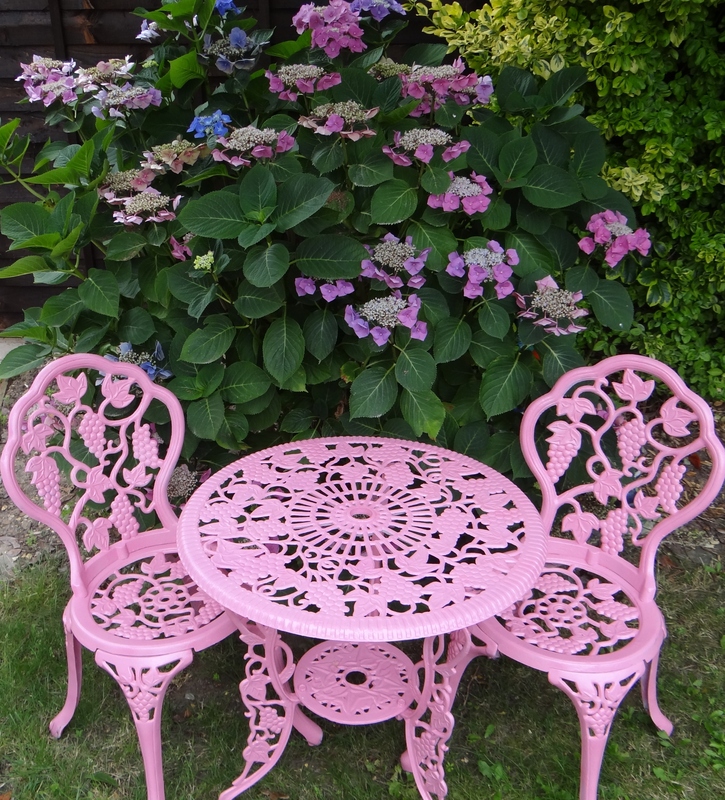 ….spraying the garden furniture (much to my husbands dislike!) the same colour as our hydrangea. 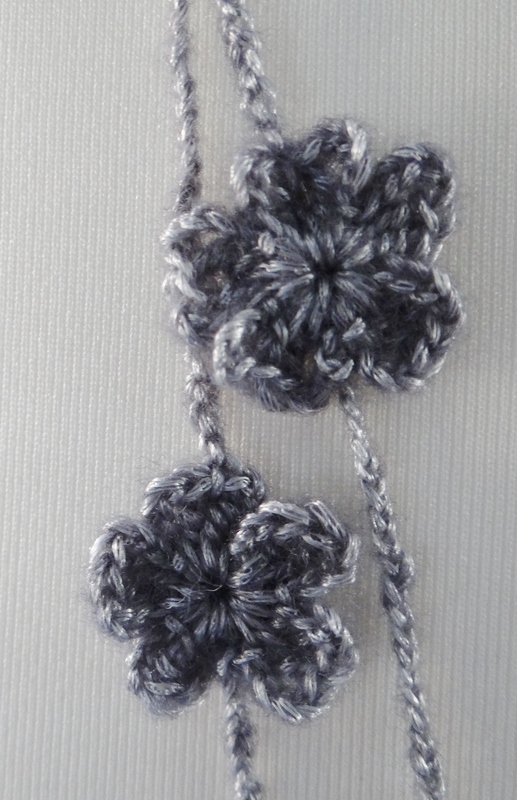 …..crocheting a silver necklace from a beautiful shimmery fibre. …popping up to West Deans Design and Craft Fair with one of my daughters to take in the beautiful gardens…. …. 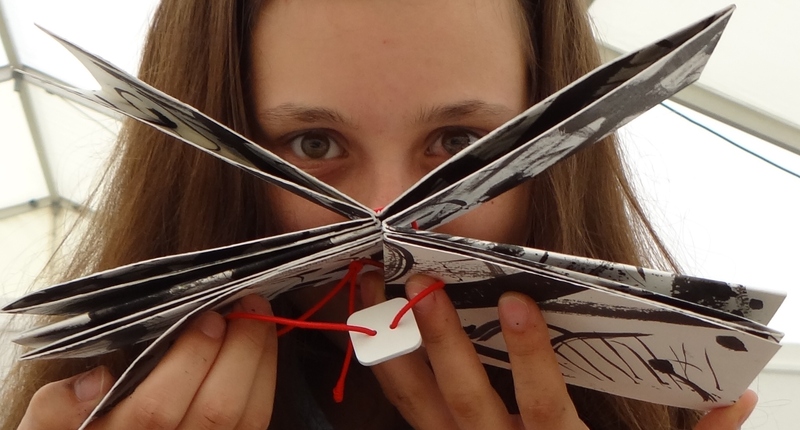 and having a go at making an indian ink “expressive stroke” concertina book in one of the workshops. Considering Art is not my strong point, I was really amazed at what you could create in 1.5 hours! So, what have you been up to this summer? What gets you “back in the zone” when you have lost your blogging / crafty mojo? Send me your comments – I would love to know! 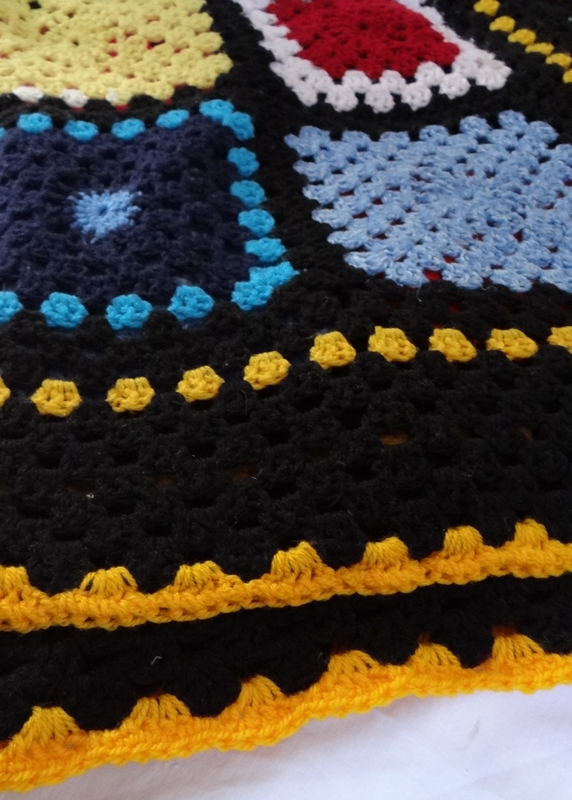 This entry was posted in Beginner, Crochet, Knitting, Sewing, Stitching and tagged How to get or find your crafty mojo vibe; the stitch sharer; by thestitchsharer. Bookmark the permalink. You’ve done a lot really!!! Love the book. I find that the old saying “necessity is the mother of invention” is what gets me going. When I need something I get inspired and get on and do it. Like recently needing some cool cotton tops before a weekend trip which I knew would be very hot, and knowing I couldn’t just take my old stuff I wear at home – ! – I very quickly made two in the few days before we went. Also, I cycle a lot, and having just got a new bike, I need a different size bag to go on the rack at the back, so I’m thinking up a design for that. So maybe just wait for necessity! Thank you for your lovely comment. My daughter wants me to make her some panniers for her bike too, have you found any good patterns or how to guides for making them? from the bike and carry it as a shoulder bag. I’ve made lots of bags in the past with my own patterns so hopefully I can do this too! Are you going to use clips to attach it or ties? Will probably try straps that go right round the rack and fix with either clips or velcro or a combination of the two! If I ever get round to actually doing it I’ll send you a pic! Sewing jobs and making preserves (they earn me money….) plus riding the bike, are taking over at the moment! That’s really encouraging to hear. What’s the long term project your working on atm? I find it quite hard to motivate myself when the sun is shining, I love to sit in the sun and read! I am currently devouring the Game of Thrones books! That’s inspiring Bella. Good to see you back. 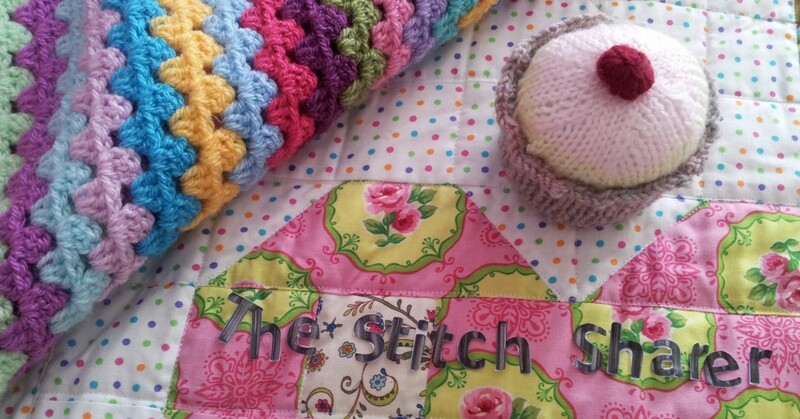 Ooh lovely projects, I love the vintage dress especially! Looks like you’ve been quite busy and creative to me! Hope this spurs you on to more making and sharing, your stuff is so pretty! You sound like you’ve been quite busy craftwise despite the trough!